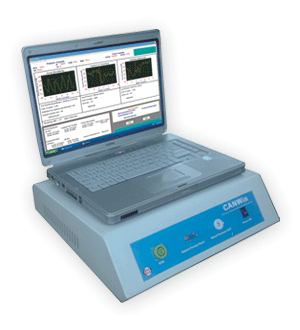 CANWin is a PC based Cardiac Autonomic Neuropathy (CAN) Analysis system with interpretation. It analyses both Sympathetic and Parasympathetic autonomic nervous system response of the patient. It uses TCG (Tacho Cardio Gramme) response to Resting HR, Deep Breathing, Response to standing and Valsalva Manuevre for Parasympathetic function analysis, and automatic NIBP response to Orthostatic Hypotension and Sustained Handgrip for Sympathetic function analysis. Automatic and precise R-Peak detection and RR interval calculation. Full ECG disclosure of each test for Parasympathetic function assessment - Resting HR, Deep Breathing, Response to Standing, Valsalva Maneuver. Works with windows operating software. Automatic Blood Pressure measurement with predetermined protocols for Sympathetic function assessment – Orthostatic Hypotension, Sustained Handgrip. Recorders & Medicare Systems P Ltd.
Also keep in touch with us on social media for latest products information.